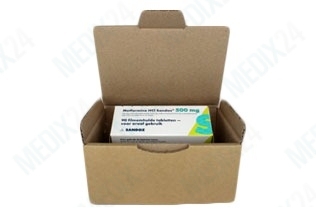 Metformin is a drug that belongs to the group of biguanides. It is used by people who suffer from diabetes. When you have diabetes, your body has problems controlling your blood suger levels. Both too low and too high blood sugar can cause serious problems, you should therefore always be aware of the warning signs and use your medication properly. 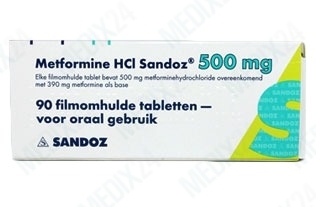 Used for treating: diabetes type 2 (non-insulin dependent diabetes). Tablets: take one tablet two or three times a day. Important: always have regular medical reviews of your diabetes. There are two types of diabetes, referred to as type 1 and type 2. Type 2 diabetes is far more common than type 1 diabetes, 90% of all adults with diabetes have type 2 diabetes. Type 1 diabetes occurs when the body does not produce any insulin at all. Type 2 diabetes occurs when the body does not produce sufficient insulin to function properly. How do Metformin tablets work? 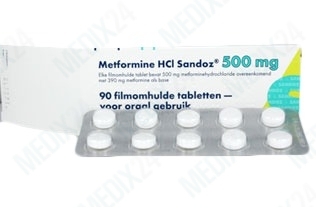 Metformin helps controlling the blood sugar levels in your body by suppressing glucose production by the liver. As levels vary both from one person to the next as well as over time, it is important you regularly check your blood sugar levels. Metformin is the only antidiabetic drug that has been conclusively shown to prevent the cardiovascular complications of diabetes. Metformin is the antidiabetic of choice for many patients and has been recognised by the WHO as being an essential medicine. Warning: You may not use Metformin when you are a heavy drinker or while intoxicated. The use of any alcohol while taking Metformin is contraindicated. Warning: You may not use Metformin when you are pregnant or breastfeeding.